Indian handset player Zen Mobiles has launched its first slider Dual GSM phone S10 with metallic body and multi-layered features at Rs.4999. Zen Mobile’s Sleek and easy to use S10 comes with metallic body making a style statement comparable to any other high-end smart phone. The handset equipped with with 2 Mega pixel camera with flash, 2.2″ QVGA high clarity wide screen, MP4/MP3 Player, FM Radio, Bluetooth and 2GB memory card. With the handset users can swing to the music of a wireless FM or inbuilt loud speakers and party harder, thus enjoying the cutting edge clarity of its MP3 playback system. Moreover it has expandable memory up to 4GB option enables its users to go beyond the barriers of space. 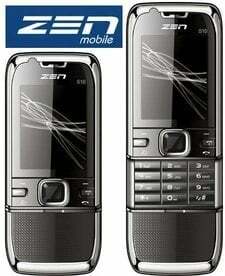 The Zen Mobile’s S10 claims a talk time up to 4 hours to its fame. A track of one’s daily life can be kept through reminders of appointments, birthdays and the latest events with notes. phone lower side of body..
its looks lyk a solar charger. plz tell me if u know..????? I will go with Lava KKT26.Its far better in features and price, though not a slider phone.price around 3700.